Enter our time machine and journey back 230 million years into the Jurassic and Cretaceous periods when dinosaurs roamed the earth. Visitors will explore custom sets with lifelike, robotic creatures, including a Tyrannosaurus Rex, Apatosaurus, Triceratops mother and baby, and a Maiasaurus with an egg nest and 3 juveniles . Walking, feeding, roaring, fighting, and caring for their young, Kokoro dinosaurs act and interact with captivating realism. Each dino is scientifically accurate, with pneumatic movements and patented skin texturing to give them the most life-like appearance possible. 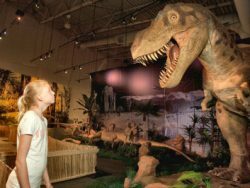 The exhibit will entertain and educate, as children will learn about scale while experiencing the magnitude of dinosaurs size and learn the difference between meat and plant eating dinosaurs.